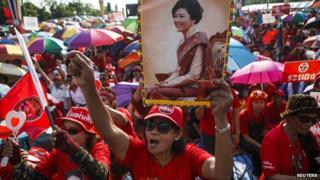 Image caption Supporters of ousted PM Yingluck Shinawatra are known as "red shirts"
Thousands of Thai government supporters are holding a large rally just outside Bangkok, their first since the prime minister was ousted earlier this week. Opposition protesters are staging another march, with riot police on standby in case of clashes. A court ordered Prime Minister Yingluck Shinawatra and nine ministers to step down on Thursday. Ms Yingluck's removal came after six months of protests which have unnerved investors and reduced tourist numbers. One of the leaders of the pro-government movement, Jatuporn Prompan, warned against installing an unelected prime minister. "You are going to create a serious crisis that could lead to a civil war that no one wants to see," he said at the rally. Thailand has faced a power struggle since 2006, when Ms Yingluck's brother, Thaksin Shinawatra, was ousted as prime minister by a military coup, accused of corruption and abuse of power. Their Pheu Thai party has a strong base of support with rural voters. Its supporters are known colloquially as "red shirts". Opposition supporters - dubbed "yellow shirts" - tend to be urban and middle class. They have been protesting against Ms Yingluck's administration for six months, occupying official buildings and disrupting elections in February. The long-running political conflict is entering a new and potentially more dangerous phase, says BBC World Service Asia analyst Charles Scanlon. Both sides have armed wings that have resorted to violence in the past, and no-one is underestimating the potential for further conflict, our correspondent says. Ms Yingluck was ordered to step down on Wednesday over the illegal transfer of her security chief. Another court has indicted her for negligence. A caretaker government led by Thaksin loyalist Niwattumrong Boonsongpaisan is running the country and says it is working towards a 20 July election. One of the leaders of the anti-government movement, Suthep Thaugsuban, said on Saturday that Mr Niwattumrong "doesn't hold the authority and status to be the head of the government." On Friday, a rally of "yellow shirts" ended with police firing tear gas and water cannon. At least five demonstrators were injured. At least 25 people have died during six months of protests.